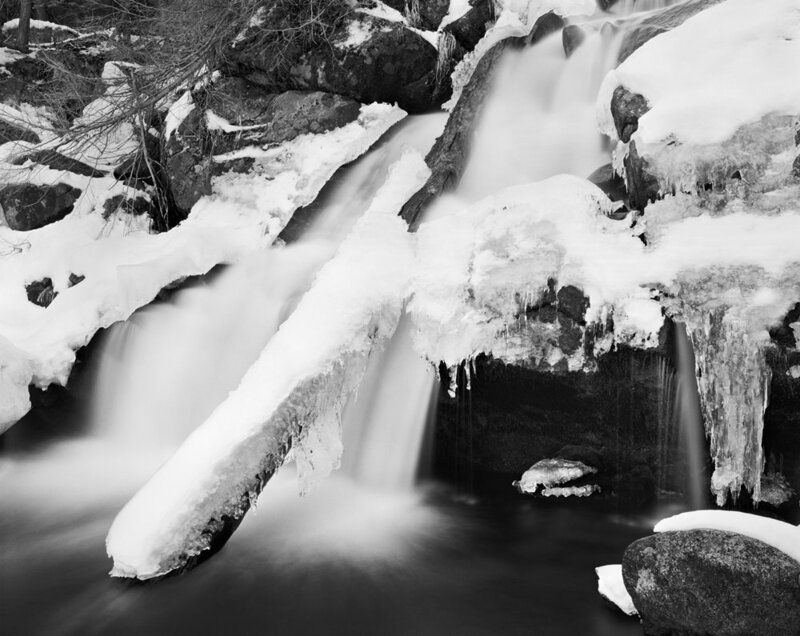 A long exposure (2 minutes) brings a soft ethereal feel ti this winter scene, contrasting against the jagged ice and granite. Here is my setup. As you can see, the short exposure in this iphone picture shares a much different feel compared to my long exposure on film. The water has a cold feel that is merely a record of the scene. There are locations that I become mesmerized with. This particular waterfall, just a short hike up the canyon where I live, draws me to it continuously. Every season brings a different look, a different feel and a different emotion. I visited this spot the previous day, in the morning in mottled light. The dramatic coating of ice and contrast between light and dark subjects enabled me to envision this scene. I knew when I wanted to return. The following day I retraced my footsteps in the snow (actually on the ice, with trekking poles), this time about an hour before sunset. This gave me enough ambient light to see well, yet the canyon was in shade. These lighting conditions gave an acceptable contrast range for my black and white film to capture (5 1/2 stops from highlight to shadow), and enabled me to have / create a long enough exposure to soften the look of the fast moving water. To further accentuate "the silk", I used an orange, black & white contrast filter, which enabled / required two stops (4x) the exposure time. The two second exposure time, coupled with the rushing water, added the dreamlike quality I had envisioned. I used Ilford FP4 plus 4x5 inch black & white negative film, as I like the fine grain. The 150mm lens enabled me to crop reasonably tight, in an effort to minimize distracting elements in the greater background. This composition was a challenge, but I often look to find calm in chaos, given my surroundings. When it came down to it, as with most of my compositions, I use the rules of composition to start, then rely on how it feels. This image feels great to me! That is The Fine Art of Nature. I hope you found this both interesting and informative. Contact me directly if you'd like to join me in the field for a private or small group workshop. I'd love to help you take your photography to the next level. Stay informed. Subscribe to Jon Paul's FREE Insider's Newsletter now! Enjoy what Jon has to share in video form on his Youtube Channel.